An engaging, organic looking contemporary chandelier that is beautifully stylish. These are going in our Master Bedroom and will complement the coffered ceiling through juxtaposition; they will soften the geometric design of the ceiling. unique design, looks fresh and stunning, I wanted something unusual and lovely. Price is right. Will go well with my boutique motif. Fun & functional. Like the light feeling it gives. I love the design. Makes me happy. Unique, feminine, beautiful. For over a dining room table. I have had this same beauty in my last two homes. It is my signature light fixture. We've had this light before and loved it- looks great up high in an entry way. Will this work in a traditional home? It’s going in a cozy sitting room with floor to ceiling windows and a 50 gal long fish aquarium ioff dining room. Thx! Yes I can totally see this light in a traditional home. Customer service at Lamps Plus is very easy to work with if you decide to return it. We purchased 27 lights for new construction with only one exchanged item. Well wishes! We love ours! 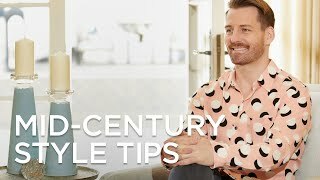 It's in an "eclectic" style home and as long as you have higher ceilings, it works. 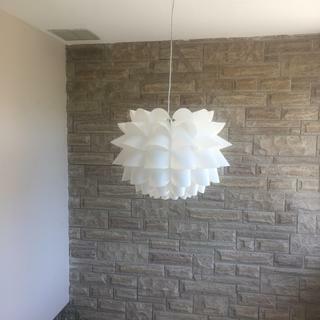 Can this chandelier be used with an 8 ft. ceiling? BEST ANSWER: Hi - If mounting over a table, yes it can. If not, it will be too long. Generally you want at least a 7 foot head clearance to walk under. Can the Ball shade be taken apart and reassembled for shipping? BEST ANSWER: Hi - The shade is not designed to be taken apart. Is there a recommended LED bulb for this fixture? BEST ANSWER: Hi, I have included an LED light bulb that is compatible with this pendant. BEST ANSWER: If you mean to ask if this comes already assembled, yes. The "floral ball" arrives looked just as in the picture. The attaching wire and electrical cord that connect it to your ceiling and power source are all that need any kind of assembly. We have ours over an entryway with a 16' ceiling, and we are very pleased with it. It is completely put together. Great light. I had an electrician hook it up to a portable dimmer which makes it even cooler than it already is. Yes ! All you need is to connect to the ceiling outlet. We love ours! Will this work on 10 foot ceilings? BEST ANSWER: This includes 10 feet of adjustable cable and wire and will be just fine for a 10 foot ceiling. It could, but you'd want it pretty close to the ceiling. 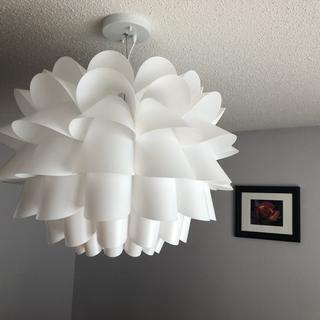 Anyone use this light in a bedroom? Anyone willing to share pictures? It is a large fixture, but if your bedroom has a high ceiling it would look great. We have it in our entry where our ceiling is 20 ft high. BEST ANSWER: Hi - the fixture itself is white. 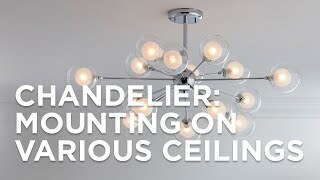 But, depending on the type of bulb you are using (2700K warm-5000K daylight) will determine what type of light will be emitting from the chandelier. Hello, No it does not give off a yellow cast, I'm using a GE 100 watt bright white blub and it looks great. I get a lot of compliments on this chandelier which is located in my stairwell to the second floor. I'm very pleased with this light. Best of luck to you in your search. Take care! Mine gives off a very nice white (but not gas station white) light. But that's going to be affected by the type of bulb you use. I put in a 100W-equivalent 2700 degree LED bulb and it's quite nice. is this lamp already assembled as shown ? BEST ANSWER: Yes, the lamp is already assembled. Yes it comes assembled as shown. BEST ANSWER: Yes, we asked the same question. But, you need to use and LED bulb. Look on the package to make sure it is LED dimmable. We love our lamp. We have had nothing but compliments. Yes, when you are using an incandescent light bulb, if you are using a led light or florescent light bulb, make sure you have a dimmer compatible for them, or it will not dim correctly. Not sure about supplied bulb. I replaced with a "dimmable" 5000K temp bulb to match my other fixtures. Yes. I have mine on a dimmer with no problem. I used a dimmeable LED bulb compatible with the dimmer switch. Could it be hung on a slope ceiling? BEST ANSWER: Hi - yes, this will work with a sloped ceiling. The design uses cord and wire which will hang straight down from the ceiling slope. I don't have an outlet in my ceiling. Can I put the long wire in a chain and run it to my electrical outlet? If yes, how can I support the fixture in the ceiling? BEST ANSWER: Unfortunately, this pendant cannot be converted to plug-in. It comes with a chain, I have a hook in my ceiling for the lamp. If this was the only light in small room would it be enough light to read by? BEST ANSWER: It is hard to say...it doesn't take a high wattage bulb. We have a 60 in it so it would be marginal to read by. The question is..."how high a wattage could this take?". This is in our dining room in Florida and we live in Mn. in the summer. So I can't check what it could take because we are far away from it right now. We love the looks of it in our dining area but it is part of a larger room where there is other light. I put an LED bulb in mine, so it's pretty bright when turned up to full light - it's on a dimmer switch. I believe it would be okay to read by, but it depends on how close you're sitting to it, how high the ceiling, etc. I used it as an entry light and it's plenty bright. 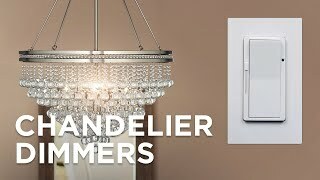 Thank you so much for answering this for me..will be pretty close to it for reading..so I believe this will work for me..and great to know a dimmer switch can be used with this light. Thank you for taking the time to answer my question! this light should work just fine I believe for the room I want to put it in. For general lighting over a dining room table it works fine for me. In such a case as yours I would want to be directly under it. Off to the side might be questionable. It is ok, but not great if it was the only light. You can easily put a 100 watt LED bulb inside, which is what we did to get extra light. my fixture is on the side wall, but want to hang this over my table. Any way to do this with this light? BEST ANSWER: You could hang this without the bulb, but when directly under it, you may see the socket empty. Why are there two cords? I like the larger size, but prefer the simplicity of one cord coming out of the top. BEST ANSWER: Hi - this particular design uses both a hanging wire and an electrical cord. We have a similar design with just a single hang cord if you prefer that look. See the attached design. One cord is a metal wire which is used to hold up the fixture, though it is not heavy for the size of it as most of it is plastic. The other cord has the power wires so you need both. However, the light comes with clips that you can use to tie the two wires together so it looks more like one wire coming out of the top. One is the electrical cord and the other a wire to secure the light to the ceiling. Well made. Can this be installed on a slanted ceiling? BEST ANSWER: Yes! 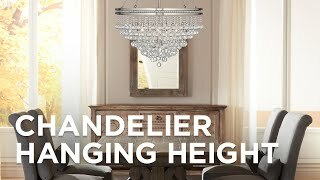 This pendant chandelier can be installed on a sloped ceiling. Yes, should be no problenm. Is the cable adjustable? What is the minimum height? BEST ANSWER: Yes, cable is adjustable. Comes with a lot of excess cable which you have to cut to the right size. 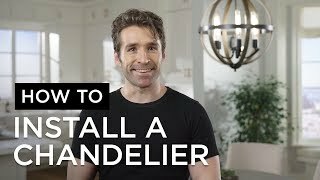 You probably need a few inches in addition to the fixture body as a minimum but if you have that short of a wire, it would look strange. I say visually, you need at least 18" of wire to look "normal"
Yes. The cable is adjustable. I was concerned with the amount of cleaning this fixture might require due to dust attraction/accumulation because of the light color and construction material. Pleasantly surprised at it's low maintenance cleaning requirements. First I'd have to say I would never have bought this based on the pictures. I picked out a couple other lights online that I liked and went into a local store to view them. Then I saw this lamp and loved it! Went home and purchased it online on the open box clearance. I have this is my dining room which is quite small. It transformed the room. It's beautiful. Every person that has seen it raved about it. One even buying one for their home. It took literally only minutes from in the box to installation. The only downfall for some that I could see is the brightness of the light. It takes only 1 100 watt bulb. But I like the lower light level and choose to put a 60 watt in. I do have another light source if needed. I love this light!! I could not be happier - it is just beautiful and makes me smile everyday. I purchased this light to create unique atmosphere in our dinning table, outstanding results. This light provides plenty of light and makes room look fresh and modern. Love it! Delivery was prompt as it was sent Fed Ex, which was my only option for shipping to Alaska. Shipping charges to AK were high, but it was worth it. It looks great and isn't the typical transitional or traditional fixtures seen in most Alaska homes. I was looking for something unusual and contemporary for my dining room. I loved the design but was worried about the quality because it is made of plastic. When I received the lamp I was very pleased. The quality is very high for this price point. The lamp does not look plastic at all and you really wouldn't know that until you touch it. Love it, love it, love it! ALL I CAN SAY IS WOOOOW!!!!!!!! This is a very nice knockoff of the famous artichoke design at a very reasonable price. Although it's a single-bulb fixture, at 100 watts it gives off a lot of light and illuminates our foyer and living room. Show stopper of a lighht! We put this light in our master bath, which has high ceilings. It looks phenomenal and brings a sense of style to our room. the lighting it gives is adequate--we also have lighting over sinks at the perimeter of the room for hair and makeup. I will let you know how easy it is to clean--my only concern at this time is that it may be a tougher job than expected. Now we just need to paint! Success! I found this light for a friend who had different ideas of what would work from her husband. We just ordered the light and had it installed (the debate had gone on for a long time). Not only were both pleased. Her husband actually noticed it (minor miracle there), liked it, and commented on it! It is in a very traditional setting and looks great. Super fast service and arrived in perfect condition. sure to get comments. Everyone impressed with the look and lighting effects. This got to be the best lamp we have purchased so far. It earned so much compliments from my friends. It gives good illumination and wears an art studio looks. It's really stunning. My friend has this chandelier and I love it! So much so I'm ordering me one! It is stunning and elegant for minimal cost you get maximum effect definitely a WOW factor. Everyone notices it upon entry it's Fabulous! I have three of these hanging in a large window in my restaurant. I am considering purchasing another to hang over my dining room table at home. This light creates beautiful ambiance. We have had so many compliments on them! This is beautiful and exactly as depicted. I vascilated between this and the smaller one for months, but finally selected this one for my dining room and it's fabulous. It looks great over our mid-century Danish teak table we just picked up! It adds just the right touch of modern style to our dining room. LOVE LOVE LOVE this item!!!! prompt delivery.no assembly required..easy installation.. 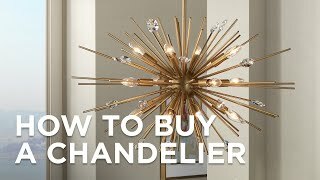 This lamp looks great and really adds sparkle to a room or stairway. Everyone who sees it is impressed. It has a great illumination pattern in the dark. fast delivery- arrived in perfect shape. Had to return it, and that was a hassle free process. Delivery was shipped to my home, and it arrived in perfect condition a day earlier than expected. The light is very lightweight but was still packaged well and arrived prior to the estimated due date. I have this light fixture installed at the front door to my home in the foyer. A large white medallion enhances it at the ceiling. Very elegant without being gaudy. We always get compliments about how beautiful the fixture is. I used this pendant as the ceiling light in my teenage daughter's room. I had studied lamp size based on room size and this completely fit the bill. It is unique and beautiful. Thanks Lamps Plus. Definitely worth the purchase, don’t hesitate. I’m very happy with the light.. definitely looks amazing in the room and was pretty simple to install. If you keep the light close to the ceiling like we did, you will have a lot of extra cord to hide in the mount which can be challenging. Hasn’t accumulated much dust in the 3 weeks that we’ve had it, and it always draws compliments from visitors. I’d definitely recommend it if you’re on the fence. The price point was perfect too. It is larger than I expected and lights up beautifully at night. 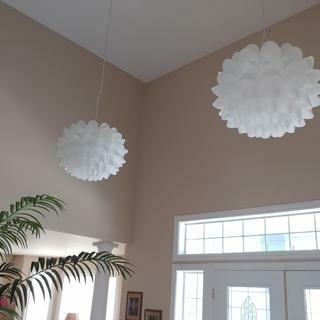 These lamps were a bit out of my comfort zone, I was replacing two traditional chandeliers in my entry way. They look absolutely gorgeous! Good quality, exactly as depicted in the advertising. Would definitely recommend them. These are hanging from an 18ft ceiling, love them! 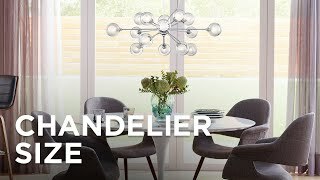 This chandelier is inspired by the Artichoke Chandelier and gives a classic mid-century modern feel. I did not want the light to be a permanent fixture, so I had to change the end of the lamp with a plug in as well as buying a link chain. Other than that, its beautiful and such a wonderful piece to talk about. I would recommend this lamp to everyone. I have it hanging over our coffee table because I wanted more light. What a big difference! I looked at this light for a long time trying to make a decision for my dining room. Imagine my surprise when I saw my light on a David Bromstead show on TV. It was gorgeous, different. Not a cookie cutter light. It looks great, just as I imagined that it would with all our redocorating. Awesome combination of modern and organic looks. My college age daughter chose it for her newly remodeled room that's painted three shades of bright blue with white trim. This white lamp looks great and we've received many compliments from visitors. Fast delivery, in perfect condition. And I live in Canada. Modern Design at its Best! Overall, the best buy for my money. I used this for our employee break area, and it looks amazing. It really transformed the space and made it look more modern. I have paired it up with white accents (such as a table and chairs, wall decor, and a white magazine rack with a dry erase board). Looks great! I love the over-sized shape and the drama it adds to our contemporary kitchen. I also appreciate that it only requires one light bulb that hides itself discreetly behind the folds of the design. We live in a climate where a bunch of unnecessary light bulbs only make the room hotter. This lamp is stunning and over delivers on lighting and quality. Fast and before than I expected. Looks great over our dining room table and matches the floor lamp. This lamp is used in our playroom. It is fun and playful and adds the right about of light! I was concerned as it was just one 100w light bulb but it works great. I saw some customer pictures on Amazon and it had a yellow glow. In person it absolutely does not and it is bright white light. Perfect for a kitchen or small entry way or playroom to jazz up the space. Hi Jennifer D., thank you for the review. We're thrilled to hear that you're enjoying your new pendant chandelier. Depending on the color temperature of the bulbs used and the warmth of other lighting in the space, the pendant may give off more of a yellow, white, or blue glow, and we appreciate you bringing this up in order for us to clarify. Thanks! Really a beautiful lamp. Only negative is the extra cord that hangs with it. It works though and is still worth the 5 stars. 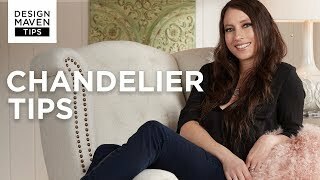 I was looking a chandelier that was unique and contemporary. When I saw this light and the price I was very pleased. 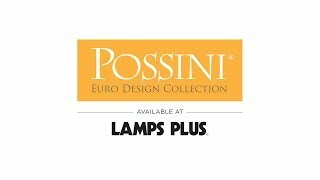 I decided to purchase this light and others from Lampsplus.com as they had the best price. I receive so many compliments on it. You will not be disappointed with this purchase. It will look great for many years to come. Best of luck! 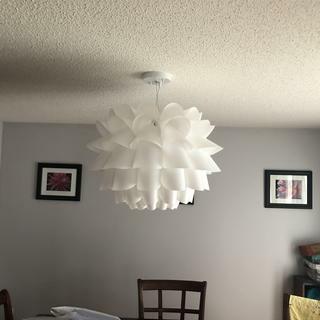 I have gotten so many compliments on this fixture from family and friends the best part is that my husband didn’t like it from the picture on the website (but I ordered it anyway and now he loves it. It is extremely beautiful at night when lit. It is very light and easy to install. We have not installed it yet but it will be great in the location we purchased it for. These look fabulous! Light is gorgeous.